What is Target Training? 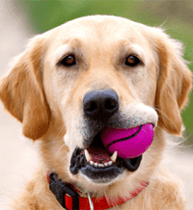 It is simply training your dog to touch a target with his nose so that you can control his body movements. It is extremely easy to train and everyone with a dog can train this behavior! You will need a clicker, you can find one your local pet store for a $1 or $2. This little device will be used to communicate with your dog (more on that later). This is very easy. All you have to do is get a bunch of treats and put them in your training pouch or your pocket. Bring your target stick and position it in a way that your dog can easily touch it with his nose. Pay very close attention! As soon as your dog touches it with his nose, click your clicker! Then give him a treat. This is simple right? Target training is very simple to do. Once your dog learns that touching the target earns him one treat, you can literally move the target around the room and he will follow it! You have two options to choose from when building a target training stick – you can either make a retractable or a non-retractable target stick. A retractable target stick enables you to adjust the length of the target training stick – which can make it easier for some training exercises, and it also is much easier to store. When I decided to build my own target training stick – I was fortunate enough to already have both of my items in my basement. The material I used to make my target stick is a retractable telescoping magnet and a Ping-Pong ball. These items are pretty cheap and can be found at your local Wal-Mart, dollar or hardware store. To get started, make a slight cut in the Ping-Pong ball of approximately one quarter inch. I have found that cutting into the seam of the Ping-Pong ball helps in having a straight cut. You can then slip the tip of the telescoping magnet into the ball – try inserting it using a 45 degree angle. Once the tip is inserted into the ball – you can then push it all the way down and you are done! You now have a hand-made retractable target training stick. There are multiple other materials that can be used to make a target stick – I have seen small tube pieces of wood for less than 2$ at home depot, and I am sure you could find some cheap balls at the dollar store. A small tennis ball would also work wonders, and are usually really cheap. In the end, this could cost you less than 5$ – and if you are on a tight budget, this might be great for you.